BSF Tradesman Recruitment 2019 notification is uploaded by the Border Security Force authorities @bsf.nic.in. With respect to the BSF Constable Notice released on 24th Jan 2019, totally for filling the 1763 CT(Tradesmen) Vacancy in BSF is delivered. BSF Tradesman Application dates are expected to be in between 26th Jan to 26th Feb 2019. BSF Constable Tradesman Recruitment, one who has the SSC Matriculation certificate are welcomed to submit the online mode of registration forms. Check the BSF Tradesman Recruitment 2019 notice for elaborated eligibility criteria. For employment needed candidates just get the opprottunity from the BSF Constable (Tradesman) Recruitment 2019. This year the Tradesman Vacancy in BSF is increased compared to the last year. Guys with only having the Matriculation certificate can grab the central government job. The official notification stating the BSF Tradesman Recruitment 2019 is released publicly so you can get that notice from thsi page. Border Security Force annually provides the advertisement of filling the hundreds of Tradesman vacancy. Like wise every year in 2019 also it commenced the notification of the CT Tradesmen posts filling process. As a part of it, intially it issued the intimation notice regarding the BSF Constable Recruitment. This BSF Tradesman Recruitment news is really a great chance to the candidates who are in the process of finding the upcoming or recent BSF vacancy. 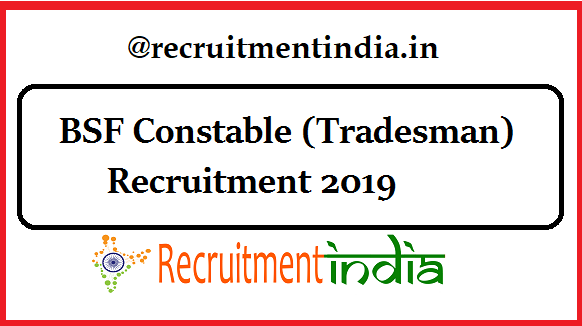 Applicant, observe the information of released BSF Constable (Tradesman) Recruitment 2019 of 1763 Vacancy in our Recruitmentindia.in portal. Firstly apart from all the details, the candidate has to check the important dates called Application starting and ending dates, exam dates of this BSF CT(Tradesmen) Notification. Because as per these dates, the registration process and the preparation of the candidate must go on. That’s why earlier to the discussing of the BSF Tradesman Eligibility criteria we are giving the important dates. Expecting the Border Security Force recruitment board will be releasing the application form tentatively on 26th Jan 2019. BSF Constable Tradesman Selection Process will be intimated correctly to the application given candidates. Border Security Force (BSF) Tradesman Salary is Rs.27,700 – Rs.69,100 per month. Total the released vacancy through the recent BSF notification is 1763 vacancy. The post wise vacancy details are explained here. The successful BSF Tradesman application submission is done by the candidates only after they have made the fees payment. Category wise the registration fees and application fees are given now. The officials before inviting the BSF CT (Tradesmen) Application Form from the applicants, it likes to discuss some important details. These are nothing but the BSF Tradesman Requirements which the BSF board expecting the candidates to possess these eligibilities. In the view of the BSF recruitment panel, these eligibility criteria having contenders are the applicable ones for these BSF 1763 Tradesmen Vacancy. Hence to convey all these it has given the notification that contains the condition of academic qualification, age limit, and Physical Measurements. Yes, this was a defense job, so the applicants must be physically fit. The three requirements have to be agreed by all the applicants irrespective of the category. Although in the notification, the confirmed BSF Tradesman Application Form dates are not given, we can suggest you check out the bottom given apply online link to get the registration form after it is opened. Exclusively to view the BSF Apply online form the web portal link is given to you. 30 days period of time is given by the BSF employment cell for finishing the registration formalities of BSF Tradesman Recruitment 2019. Tentative dates are 26th Jan to 26th Feb 2019. So wait at this page to get your BSF CT(Tradesman) Online [email protected] on 26th Jan 2019. BSF Tradesman Selection Rounds comprises written exam and PET/PST tests. Right details about the BSF Tradesman Syllabus is given at our site.